For the past 13 years, Career Directors International (CDI) has utilized International Update Your Resume Month as a platform for educating job seekers on the important of maintaining up-to-date resumes. However, this year they have also outlined key tips for professional resume writers on how to capitalize on the event to better spread the word, help more people, and gain publicity. While making a difference with resume writing tips, advice, articles, and workshops, remember that this is a unique opportunity to spread the word about the value of hiring a professional. 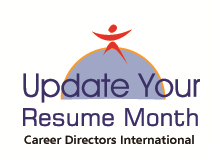 Fourteen years ago, the global organization of resume writers and career coaches, Career Directors International (CDI), registered and launched the international event, Update Your Resume Month (UYRM), to take place each year in September. With summer having come to an end and children back to school, it continues to make sense that adults should take this time for personal career-caretaking. #1 – Decide what to do for the event. Announce a free teleclass or webinar that is open to the public. (Then, of course record it to give as a gift on via the website in the future). Author informative articles and blog posts to be posted on the website or on third-party sites. CDI members will find numerous courtesy resources in the member’s section from which to create presentations and information pieces. Add the event to signature file for emails and blog posts. Wait until the end of August to start planning and chances are any efforts will be put on the backburner until 2015. Why wait? With a little strategy now, rewards can be had for efforts this September! Visit the public job-seeker page for UYRM. Learn more about CDI member benefits for resume writers and career coaches.